I have a simple circuit that runs off of a 9V battery. I'm re-designing it so that it can also run off of an external 12V DC source (ie: a wall adapter). I want to design the circuit so that if both the battery and the wall adapter are connected simultaneously, the wall adapter is used, and the battery is effectively disconnected from the circuit. I've found a few circuits online that might work, but they unfortunately might allow a trickle of current into the battery, and since it could be a non-rechargeable (ie: alkaline) cell, this could be disastrous. I've considered the using a barrel jack with a normally-closed three-terminal contact configuration, but I'm not quite sure how to start. 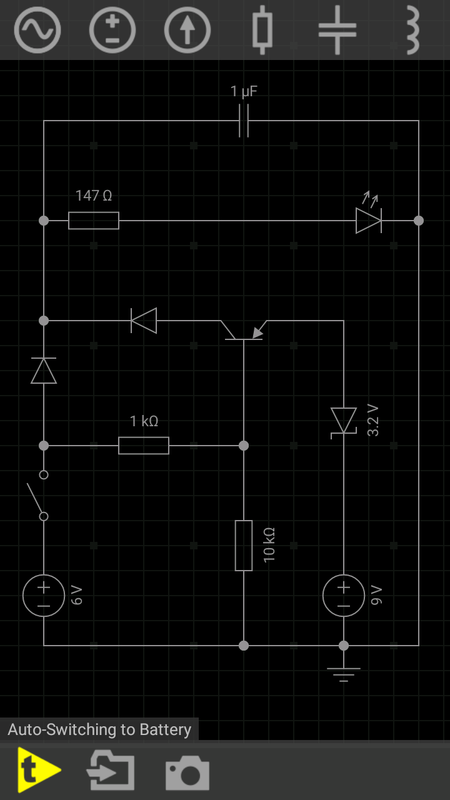 How would I go about designing such a circuit? The NC (normally closed) terminals (2 & 3 in the sheet) must connect the battery. When you plug in the adapter, this terminals opens. Try to determine on which pin (in addition to pin 1) the adapter connects (i can't determine the number from the sheet). Edit: The battery connects between pins 1 & 2. All you need is 2 diodes for your 2 power sources. 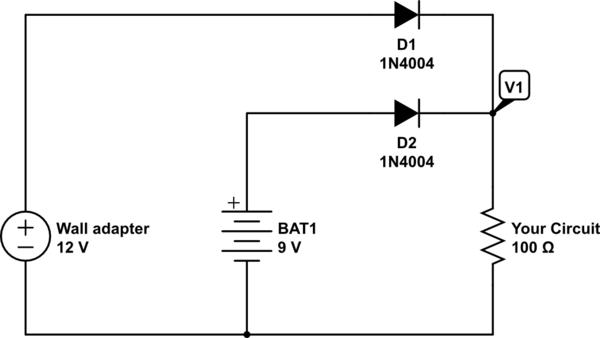 Your circuit will use power from the one with the highest voltage. When the adapter is plugged in, V1 will be 11 volts (ish). When the adapter is removed, your circuit will have 8 volts at V1 from the battery. There is no risk of the battery being charged by the adapter as the battery diode will block all current in the reverse direction. The diode part numbers are not critical. Just select diodes that match the current needed by your circuit. Take a look at the PowerPath Controller LTC4412 or the Prioritized PowerPath Controller LTC4417 from Linear Technology. They have some more of these PowerPath devices. Or you can take a relay. The wall adapter controls the relay to open/close the line to the battery. AC wall adapter plugged in, relay on and battery line disconnected, vice versa. Then you have no voltage drop. With the use of diodes, even shottky, you always have the disadvantage of the diodes voltage drop. And if the circuits current consumption is high, the size of the diodes will increase. The problem with voltage drop will get worse. There's a DC 6V adaptor powering load (resistor+LED) when mains AC power is available at home. 1K 10K resistor network biased to PNP transistor holds it in cut-OFF state when line power is available and thus disconnects the battery. But if there's a power cut which is indicated by opening the spst switch placed next to 6V adaptor source, the PNP transistor's base is acted upon by 10K resistor only, pulling base voltage to GND level. Hence PNP switches ON and load is now powered by 9V battery. PN Diodes avoids interference between two sources. Now you may think "why zener 3.2V is connected to 9V battery?" Ans: During the testing I observed that battery voltage must be less than or equal to that of adaptor's voltage output. So zener simply drops 3.2 volts across it and circuit works fine. Thus only one source is active at a time. And load is continuously kept powered up even when mains supply cuts OFF unfortunately. I think Carpetpython's circuit is using a center negative DC barrel plug since pin 1 on the jack is the center post. Invert everything for a center positive DC barrel plug.Flip the diode orientations. With a center positive circuit, the load GND will be slightly above true 0V since there is the diode drop of ~200mV with an average Schottky diode. When the dust settles on this one....the easiest solution is a on/off/on double throw, double pole switch. Namely Battery supply/Off/External power supply. Not the answer you're looking for? Browse other questions tagged power-supply power batteries switches wall-wart or ask your own question. Do I need to add a current limiter to this battery pack I'm making? How does the battery and power adapter interfaced in the laptop? How can I make battery supply power when wall adapter supply is disconnected?